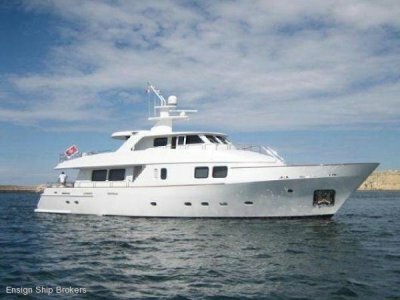 Mahalo a Johnson Yachts 77 Skylounge with country kitchen style galley up, four cabin plus crew, full beam midship master, hydraulic bow and stern thrusters, fin stabilisers, a highly specified long distance cruiser that can handle big seas, presents in excellent condition. Mahalo is no different, a stunning big interior volume 77 this boat is built to entertain, from the aft deck to the forward open plan country kitchen space abounds. Feel free to choose, escape if you like, between the salon and the skylounge you will always have room to watch something different on TV to your family and other guests should you desire. 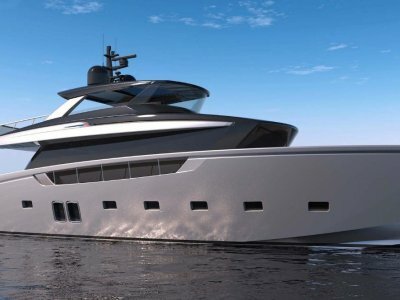 If outdoors is more your thing adjacent to the skylounge this Johnson 77 has a teaked aft flybridge with a BBQ and space for removable outdoor seating. 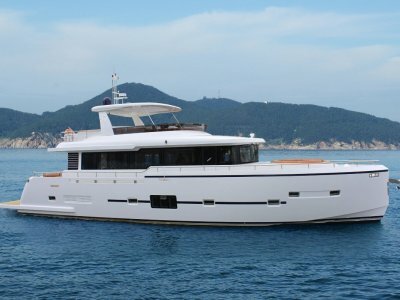 Alternatively head down to the main deck and forward to find the bow sunpad. Multiple entertaining zones like these means there will always be the opportunity to relax, or invite loads of friends and family around and never feel crowded. Powered by low hour CAT 3412E work horses that have been Hastings Deering maintained will offer peace of mind on any longer passage. In addition to this engineering wise the components throughout are all high quality and internationally renowned. 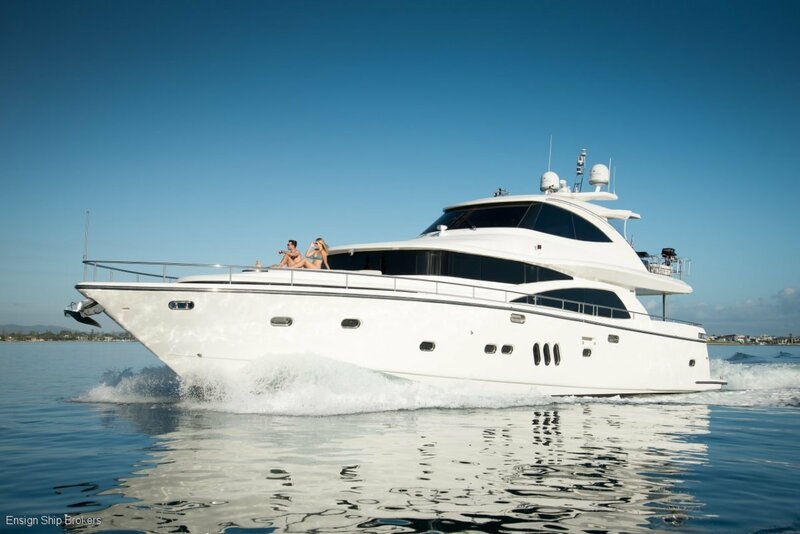 Inspection of this stunning Johnson 77 is a must, her features, presentation and layout are sure to appeal to the most discerning of buyers. Call E S B Mooloolaba now for more details. Riviera, Sunseeker Princess, Azimut, Ocean Alexander, Maritimo, Fairline, Ferretti, Grand Banks, Clipper, Whitehaven. SALOON: Aft salon with pop up TV to Starboard, portside armchair, 3 seat lounge and a 2.5 seat lounge all in leather. Full beam midship master with walk in wardrobe, chaise lounge, lift top dresser, huge ensuite. VIP Stateroom forward with large hanging locker, lift top bureau, spacious ensuite 180 degree wrap around windows and skylight provide excellent natural light. 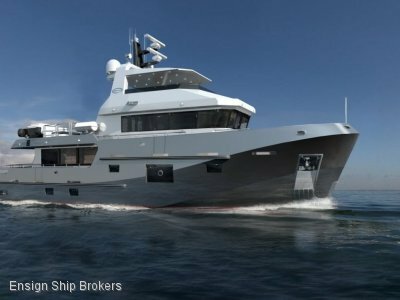 Port and Starboard are Twin Singles with hanging lockers spaciuos ensuites and massive 10 ft headroom. Crew: Aft twin single. LAYOUT: Open plan country kitchen style galley forward, U shaped dinette with 180 degree views forward provided by wrap around windows.